It will be another season in Ladbrokes League 2 for Peterhead after they lost 2-1 to Stenhousemuir on aggregate in the play-offs. The Blue Toon put in a spirited display at Balmoor to win 1-0 but it wasn’t enough after losing 2-0 at Ochlview in midweek. The Peterhead squad was devastated by injuries and this was most apparent as second top goal scorer Russel McLean was forced to slot in at centre back. Stenny immediately exploited this and one minute in Mark McGuigan wasted a glorious opportunity as he beat the offside trap at half way and was clean through one on one with Greg Fleming before blasting his shot over the on rushing keeper and well over the bar. They were at it again five minutes later as make-shift centre back McLean was caught out of position and Martin Scott headed on to Harry Paton but Jamie Stevenson did well tracking back and made a good recovering challenge. Stenny then had a shout for a penalty turned down by referee Greg Aitken as the Warriors once again exploited McLean at centre back to get in behind and the former East Kilbride man sent Edward Ferns to the ground with a very obvious push however it was a soft one and Peterhead were let off once again. Peterhead had their first good chance of the game on 28 minutes as Alan smith laid the ball in to the path of Scott Brown who had a decent from 18 yards which was just wide of the top corner. Just before half time there was a big chance for Peterhead as Simon Ferry played the ball to Alan Smith who drove it across the face of goal from the edge of the box and his effort was passed Chris Smith but cleared off the line by Ross Meechan. Peterhead kicked off the second half and Stenny won possession back straight away and Ferns raced down the right flank and crossed to McGuigan who headed over from six yards. The Blue Toon then blew a massive opportunity to pull themselves back in to the tie and Willie Gibson’s cross was met at the back right post by Jordon Brown who headed back across goal where Jamie Stevenson volleyed over from five yards in an chance that looked harder to miss than score. Stevenson then had a shot from 20 yards which was powerful but straight down the throat of Smith as Peterhead looked a different team in the opening stages of the second half. And it paid off as they made the breakthrough on 53 minutes starting with a Jack Leitch shot from 30 yards which was tipped over the bar by Smith. From the resulting corner Russel McLean rose highest to head his side in front and back in to the tie. Stenny had a good chance five minutes later a Ferns low drive from inside the box forced a good block from Fleming. 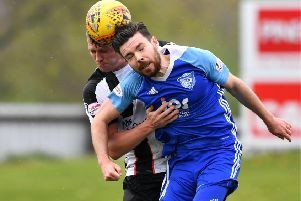 Peterhead were reduced to ten men on 65 minutes when David McCracken, who was booked in the first half, was show a second yellow for a ludicrous hand ball as the blue Toon lost their captain and only natural centre back. Despite this Peterhead continued their second half dominance and had a good chance on 80mins as substitute Aaron Norris’ powerful drive from the edge of the box went just wide of the near post. Two minutes in to injury time and Peterhead were reduced to nine men as Jack Letich was shown a second yellow card for an off the ball incident and one minute later it was all over as Stenny had survived a 45 minute barrage from the Blue Toon to go back up to League 1 at the first time of asking. Stenhousemuir will play in Ladbrokes League 1 next season after a 2-1 aggregate victory over Peterhead in the play-offs. Despite losing 1-0 at Balmoor in the second leg the 2-1 aggregate victory was enough for them to scrape pas the team that finished 22 points ahead of them in the table this season.